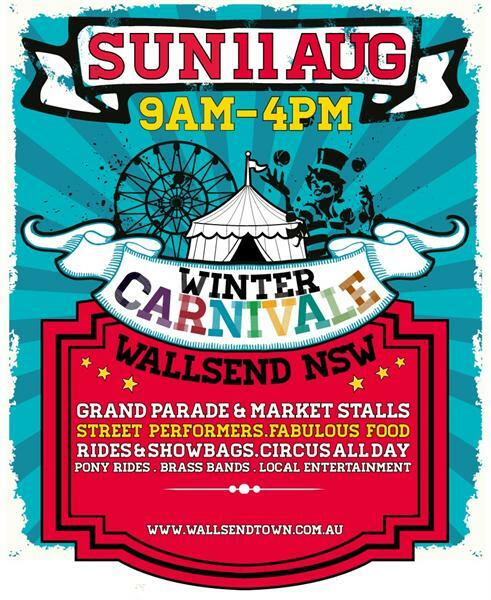 Winter Carnivale at Wallsend - The Biggest Event in the Western Suburbs of Newcastle On the second weekend in August, Wallsend Town celebrates the Winter Carnivale, a fun, family day where friends and visitors spend a fun, quality day out enjoying free entertainment, business special offers, market stalls and rides. The event involves of over 400 people and 30 local community groups showcasing their products or services.With a Traditional Circus Theme, Circus Avalon wows the crowds with High Wire Trapeze, Roving Street Performers, Clowns and Circus Acts. Over 30,000 people enjoy the fun of the Winter Carnivale @ Wallsend.